I relish growing things that are uncommon or rare. Of course sometimes it is rare because it is nearly impossible to grow. Other times it is rare because of its size or subtlety and few have taken notice. 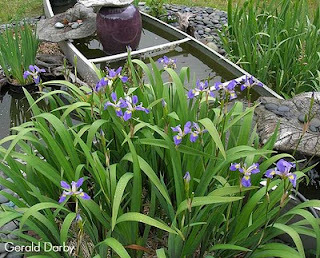 Of the later type, one that is easy to grow is Iris henryi. One of my favorite irises is this little bit of an iris. It has very narrow grassy foliage and flower size more common in violets. As a matter of fact that would be a good description for it. The violet of the iris world. It even happens to open a pale violet before aging near white. A clump of Iris henryi in flower is just, well, adorable! Surprisingly, a clump in bloom is very showy. It covers itself in flowers. The foliage is evergreen so there is never a chance of misplacing this diminutive beauty. 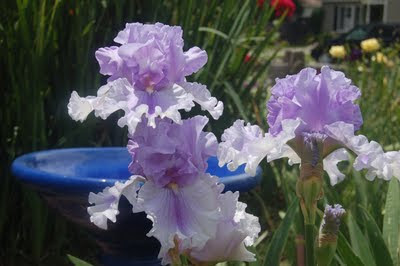 It flowers in abundance early in the bearded iris season: Mid to late April in Kansas City. 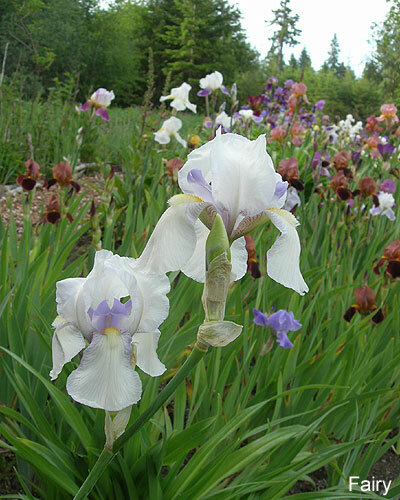 So far there have been no pests or problems with this iris. It increases rapidly when moved then settles down to concentrate on flowering. At bloom time the older foliage splays neatly to showcase the flowers that are only two to three inches in height .The leaves can reach ten inches but always gracefully arching to appear smaller and in perfect scale. Everything in perfect proportion. When I say Iris henryi has grassy foliage, I really mean it. This could be difficult to find in a lawn of bluegrass. It is best suited to the front of the border in a shade garden, but with bright enough light to encourage flowering. It does not seem to require frequent division but I would encourage that you do so in late summer and share it with close friends. 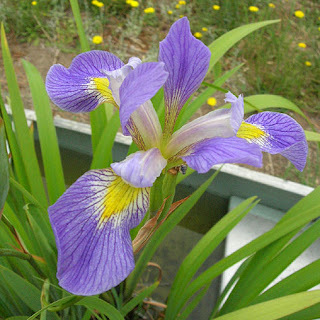 Iris henryi is a member of the beardless Series Chinenses and is from West Central China. It is a close relative of I. odaesanensis, I. speculatrix and a few others. We are thankful to Joe Pye Weed's Garden for propagating and distributing this little rarity. Iris henryi, a marvelous, if tiny, gem of an iris. The iris 'Fairy' holds a singular distinction - it is the very first iris to be hybridized and introduced in the United States of America. 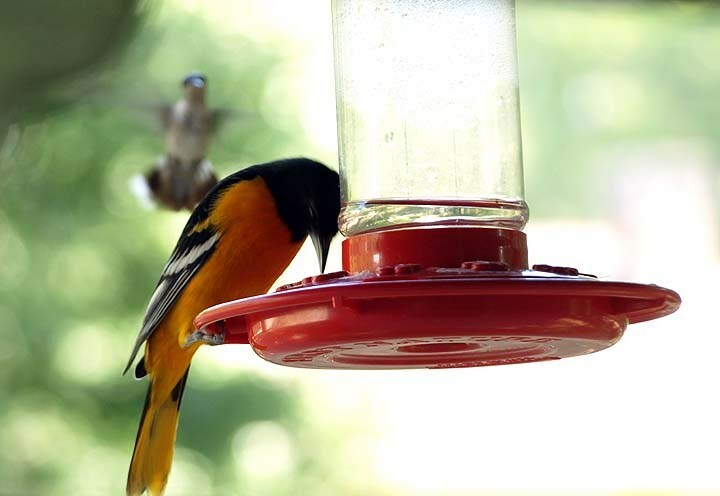 It was created by Amasa Kennicott who lived near Carbondale, Illinois, and was introduced in 1905. Very little is known about this iris, nor the man that brought it to us. We know he loved flowers and was an able plantsman, having learned from his father, Dr. John Kennicott, himself a renowned doctor who had moved to Illinois with his brothers in mid-1800's and prospered supplying plants to settlers from his home at The Grove. 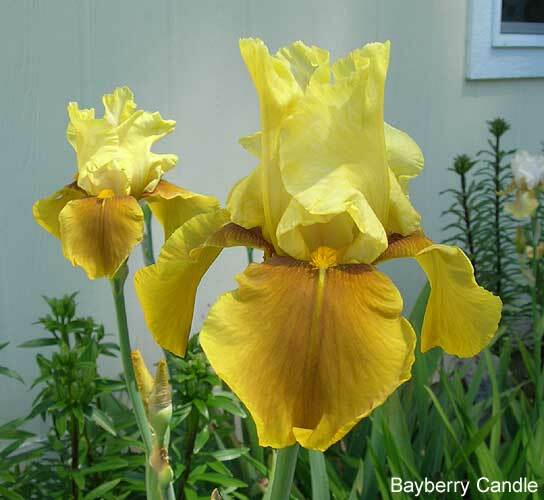 'Fairy' is a lovely iris that has all the charming features one could want. The dainty blooms are held high on tall slender stalks. 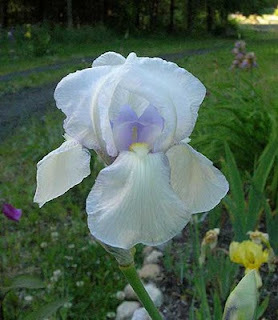 A clear glistening white in color, they are accented beautifully by the light purple style arms and crests at the heart, and the petals have a pale ghost of this color feathered along the margins. Just a hint of lemon yellow on the tips of the beard filaments adds yet another pleasing note. It is very floriferous, vigorous of growth and hardy everywhere. 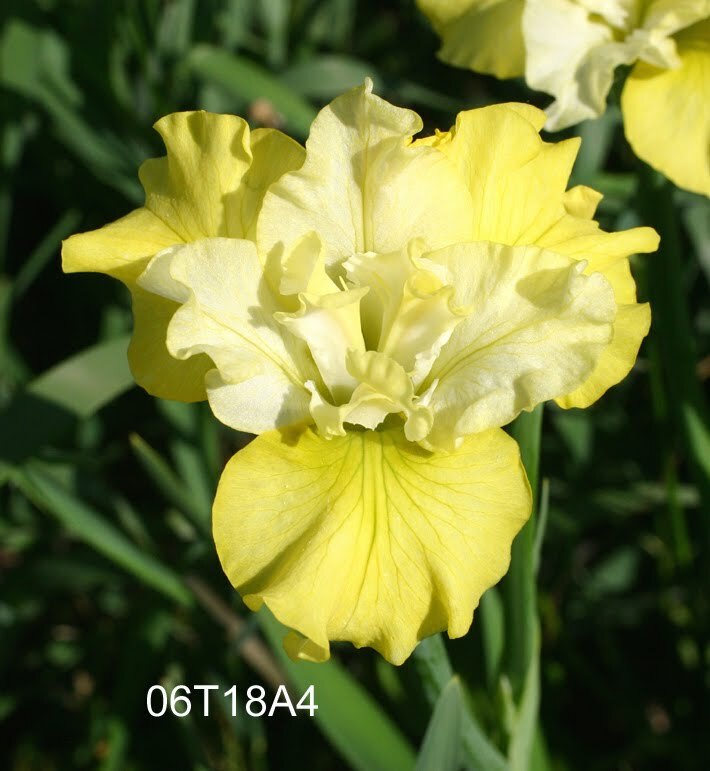 While in life he dwelled in the shadow of his famous father, Amasa lives on in iris history as the hybridizer of the first American iris. You can read more about the illustrious Kennicott family and their story on the Illinois frontier in Clarance Mahan's book Classic Irises. 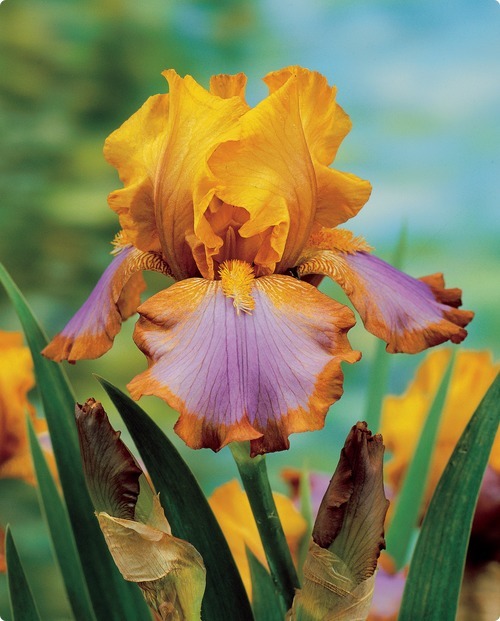 'Fairy' is much loved by collectors and is widely grown in historic iris collections around the US. 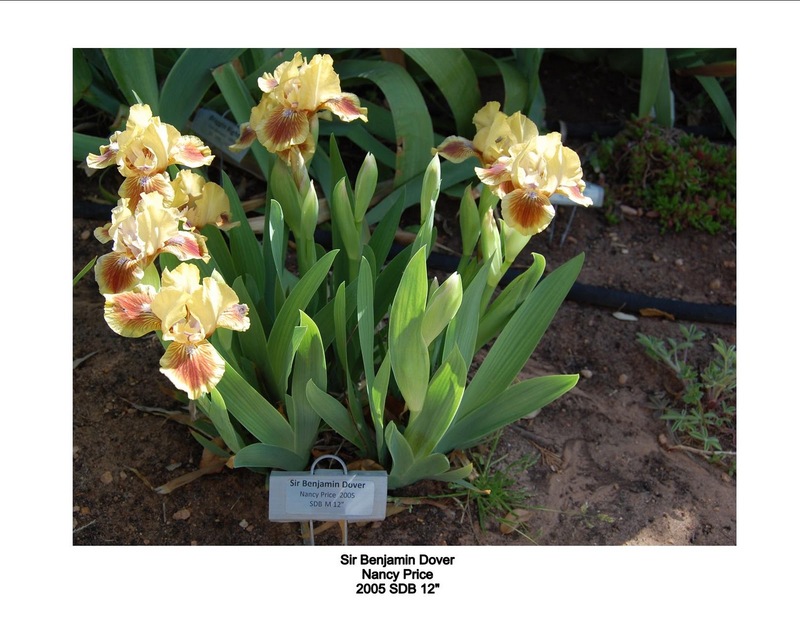 Perhaps it is one you will add to your garden as a memento of the long and illustrious history of irises in the US. Late August and early September is harvest season for Siberian seed pods. After a couple of weeks to dry out, it’s then time to open up all those promising capsules and find out what’s inside. I just finished doing this for the 2011 crop and came away rather disappointed, particularly with the yield of tetraploid seeds. Breeding tetraploid Siberians can be a test of resolve for several reasons. First, with a few exceptions, they are reluctant to set pods – just less fertile than diploids which generally set seed with abandon. Whereas maybe 70% of diploid crosses end up producing seeds, probably only 20% of tetraploid crosses do so – and that in a good year. Not only that, the tetraploid pods typically contain fewer seeds. Finally, it’s not unusual for these seeds to germinate more slowly and less completely than diploids. So the overall result is much effort for few seedlings. Maybe this relative infertility explains why tetraploid Siberians are not found in the wild – not only would their production be a rare accidental genetic event, but they are less likely to produce seed to compete with diploids in the next generation. For every diploid cross that produces a hundred seedlings you might get only ten from a tetraploid cross. You might think this relative infertility would improve with time as the more fertile tetraploids produce later generations that breed more freely. If so, I’m not sure I have seen it yet. There are a few tetraploids that are quite fertile: 'Moonlight Fair' and 'Simon Says' show up repeatedly in successful crosses along with a handful of so-far unnamed tet seedlings. Most are more reluctant, but with persistence may yield some seeds, and a final frustrating few just refuse to ever breed. Perhaps the most poignant result is to produce a remarkable new variety and find it is resolutely sterile. Two of the loveliest seedlings we ever produced are 97B1B25 and 97A2B52. Dozens of attempts to get them to be parents have failed utterly and neither were introduced for this (and other) reasons. Because of this differential fertility, after a while, the fertile ones begin to dominate the seedling gene pool in the garden and there is a certain sameness about the new seedlings, so it takes a continual infusion of new genes to maintain the variety that every hybridizer prizes. The main frustration though is that often you can visualize a good cross that should produce new and wonderful things, but you can never get there. Many lines of development are either closed off or peter out prematurely as fertility is lost. I mentioned 20% success “in a good year”. What does that mean? Well, the chances of getting seed to set is clearly temperature-dependent. In my experience there is no point in making tetraploid crosses when the daytime temperatures rise into the higher 80s, as they often do. Diploids too are less likely to set seed then, but not to the extent of tetraploids. Even in a cooler year like this year, many pods develop but contain few, if any, seeds – I call these false pods. Strangely, this year virtually every cross made in the later part of this season, whether diploid or tetraploid, gave mainly these false pods. I have no idea why, but that’s the reason I’m not entirely happy. As if that were not enough, there is yet another challenge with breeding tetraploids – it is harder to get recessive traits to reveal themselves. This arise from the fact that tetraploids have four sets of chromosomes not just two, and therefore have four copies of each gene. For a recessive trait to show up in the progeny, all four genes for that trait have to be in the recessive form, not just the two as with diploids. In the end it is roughly four times as difficult to bring out any hidden recessive trait (red or white/yellow colors for example). So, you would need many more seedlings to get the same expression of recessives as with diploids, and for the reasons above, you actually get many fewer in most cases. This again makes certain breeding strategies involving the subsequent recovery of recessive traits in later generations much more difficult. So, there’s a quite obvious question, if breeding tetraploids is so much more difficult and frustrating than diploids, why bother? Partly because of the challenge and sheer stubbornness, but more significantly because when things do go right you can get some wonderful flowers. 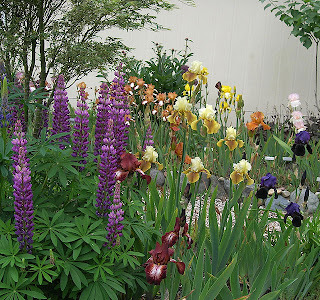 By no means everyone prefers tetraploids and they certainly haven’t displaced diploids from the Society for Siberian Irises' Favorite Fifteen list, but they are appreciated by many (seven of the top fifteen vote-getters are tetraploids in the most recent 2011 Siberian popularity poll). Large flowers, strong ruffling, vibrant colors, and even new patterns show up, generally with excellent vigor. Here for examples are four recent tetraploid seedlings still under number showing further development of the plicata pattern that first appeared with 'Emily Anne,' and a couple of others in which the ruffling and form are superb. This is what makes it all worthwhile. I am sitting here transfixed...by my window watching it rain--well actually pour down. This might not seem to be such an unusual thing, unless you know that we have had only .6 of an inch of rain since September 2010. Well, what am I doing sitting here…I’m going out to run in the rain! Will be back to work on this blog when it stops raining. Median Iris –What are they? 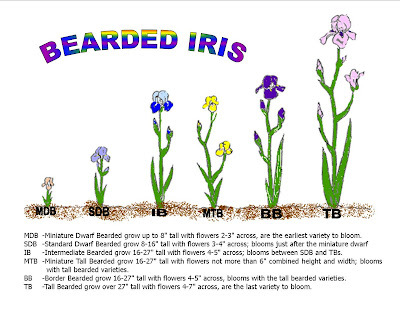 They are a group of bearded iris that are shorter than the tall bearded (TB) iris and taller than the miniature dwarf bearded (MDB). They bloom after the MDBs and mostly before the TB iris. They extend the iris bloom season with regal form, remarkable colors and patterns. 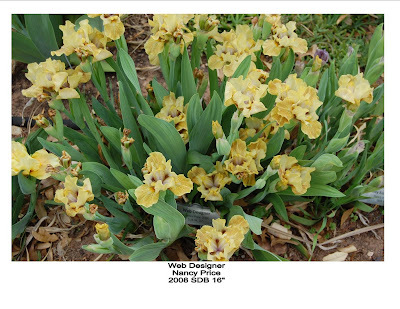 Median iris are smaller and compact compared to the tall bearded iris. They make perfect plants for borders or in the front of your flower beds, and make ideal additions in rock gardens. Medians tolerate wide varieties of conditions being much more cold tolerant, withstanding strong winds, and strong rain downpours. When the Median Iris Society organized in 1948, five new classes of bearded irises (MDB, SDB, IB, MTB and BB) were added to the already popular TB iris class. 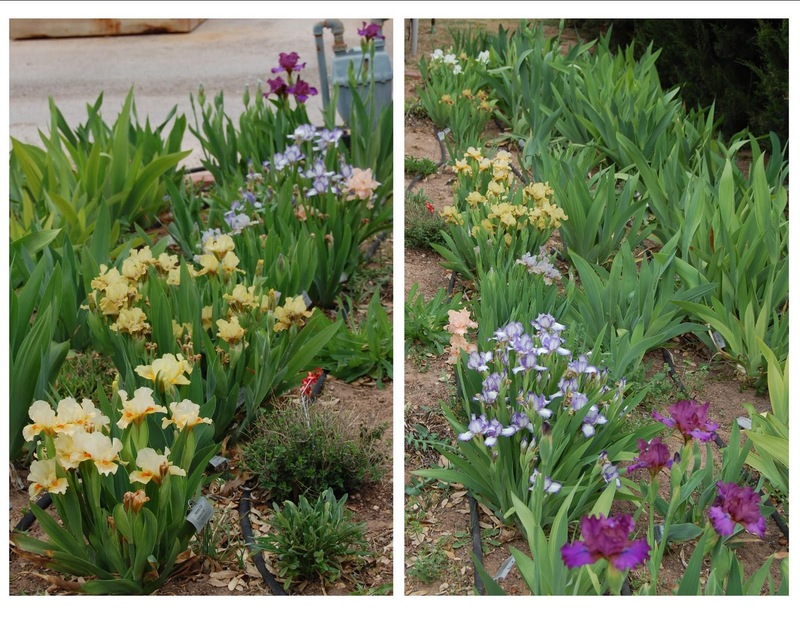 The result of this effort was having four distinct bloom seasons starting with the miniature dwarf iris season, followed a little later by the standard dwarf iris season, and then later came the intermediate bearded iris season and finally the border (BB), miniature tall (MTB) and TB season. 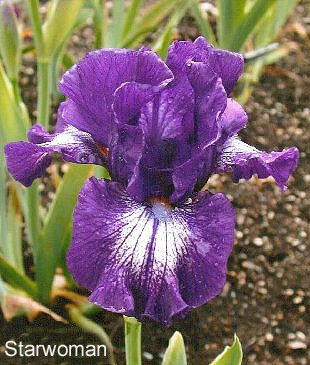 Median iris come in four different classes. 1. The crossing of I. pumila with the tall bearded (TB) iris resulted in what is known as the standard dwarf bearded iris (SDB) type. The SDBs are 8–15” in height with blooms that are 2-4” in width. 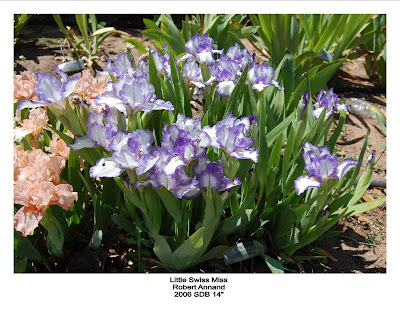 The SDBs bloom after the miniature dwarf bearded iris and slightly into the intermediate iris bloom season. They have thick attractive mounds of sword-like green leaves that grow throughout most of the season. The SDBs have an enormous variety of colors and patterns and that combined with a great vigor and ease of growth make them a wonderful edition to all gardens. 2. 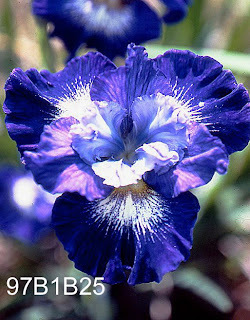 Then there are the crosses of SDBs with TBs (or TBs with species iris) that grow into the intermediate bearded iris (IB). The IBs are 16-27” tall with flowers that are 3½-5 wide. The IBs fit both in size and bloom time between the SDBs and the TBs. 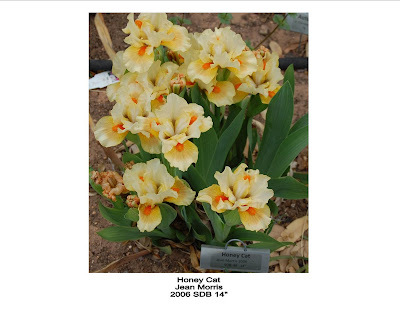 They are very hardy growers, dependable bloomers, disease resistant and can withstand high winds, sudden freezes, and other unexpected weather changes. They come in the full range of colors and combinations as the TBs. 3. Next we have the miniature tall bearded (MTB) iris that are 16-25 inches in height with very slender dainty stalks and nicely branched stalks with flowers whose combined width and height is not more than 6” total. 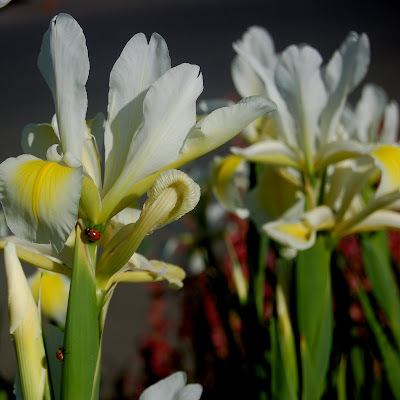 They started as diploid runts of iris that first appeared in TB gardens. Then hybridizers used I. aphylla's, a family of shorter tetraploid species bearded irises that increase branching and have smaller flowers than TB’s. They started by crossing I. aphylla with selected BB and short TB until they developed a tetraploid MTB that met the same requirements as the diploid MTB. The MTBs have a very pleasant fragrance that is essential in this lovely iris also aptly named the table iris. The flowers are less ruffled and more tailored than the TBs. The boom season is later the IBs and about the same as border bearded (BB) and TB. This class is ideal for floral arrangements. MTBs are the best branched of the medians, and fit nicely in the garden. 4. 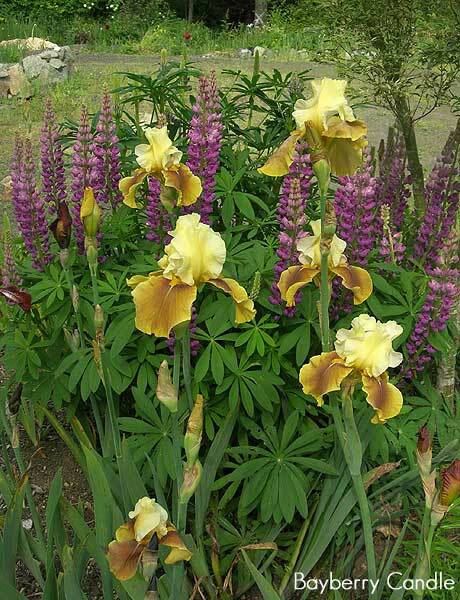 The class of medians known as border bearded (BB) started as small versions of TB iris that did not overpower other plants in an ornamental bed, and did not blow over in high winds, and worked well in flower bed borders. Over the years since BB became a class, hybridizers have made great strides in the improving the vigor, consistency of height, flower proportion, colors and color patterns. Bloomstalks of BB should be 16" to 27.5", the width of the flowers should not exceed 5”, the height of the flower should not exceed 8.5"and they should bloom along with the tall beardeds. BB iris look like and bloom like the TB iris but their size are smaller and properly balanced for its smaller size with erect fans that do not obscure the blooms. 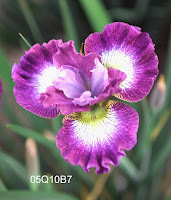 I am Debbie Strauss, a newbee in the median iris world. I am a member of The American Iris Society and just became the director in charge of the silent auction at the National Conventions. I am a Median Iris Society member and their new fundraising chair. I live in far West Texas in a desert-like environment. TB iris do wonderful here, especially if you stress them out before planting the new rhizomes (if you purchased them from anywhere except West Texas). Four years ago our local iris society hosted a fall regional convention for Texas; I was the iris auction chair. I wrote to every hybridizer I could and sent them a little money and asked for iris for our regional auction. I was not particular about what they sent and I received many many iris. Hmmm…lots of medians…their colors and patterns were too tempting, so I bid on and won many of them…I planted them and the first year they all did well and multiplied and at least half of them bloomed. Then the second year…I can’t even describe how delighted I was when the SDBs were lovely large clumps and bloomed beautifully. If you look at the photos below, you will see why my first plantings of median iris made me a big fan of the wonderful median iris classes. The pictures below are from two year clumps! They are growing in my West Texas soil that is a very alkaline sandy mix. They are planted along side my hot driveway, with a large stinky hedge behind them. We get very little rain, only a few winter days below freezing, and rarely have below zero temperatures. We have wind with spring gusts from 30 – 60 mph nearly every day. To make it really bad; we had 68 days this summer of over 100-degrees and until last week only .6 inch of rain since last September. 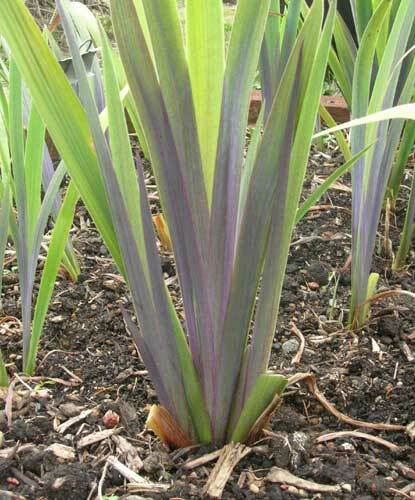 So for any iris to grow and prosper here…takes a miracle…well a very good hardy plant anyway. Even though the TB irises are the most popular iris among the AIS membership, I believe it might be because conventions and shows are scheduled around the bloom season of the TB iris. Perhaps like me, many people have not given the medians a chance. 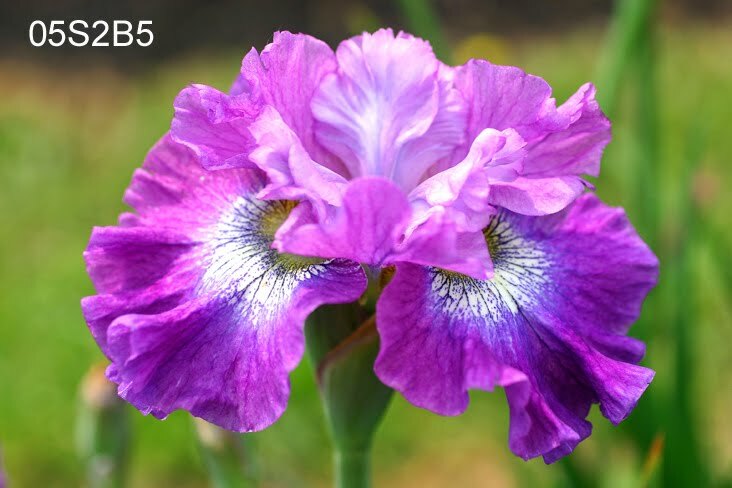 Even though only one border bearded iris, 'Brown Lasso' and one Intermediate Bearded iris, 'Starwoman,' have been awarded the AIS’s highest award, the Dykes Medal, I think those numbers will increase. Here are pictures of these two wonderful median Dykes winners. 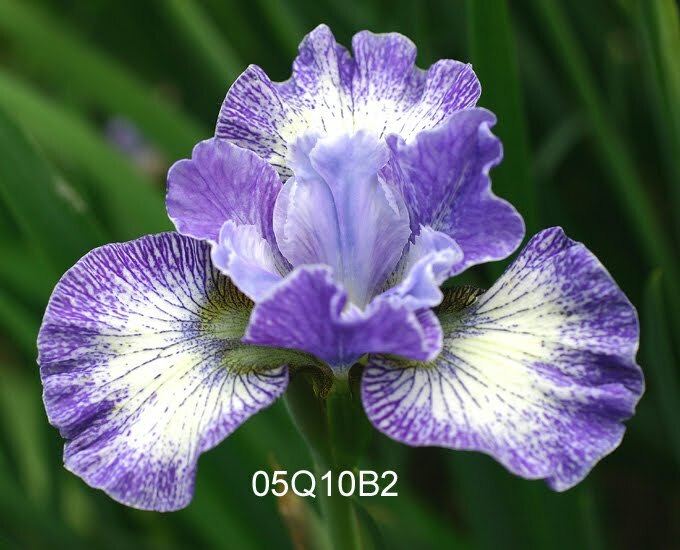 I am predicting with all the stellar work of the median iris hybridizers median iris popularity will increase leaps and bounds in the near future. If you have not yet planted a median iris or two, take a leap of faith, look through the many colors, patterns, sizes, and bloom times and get started. 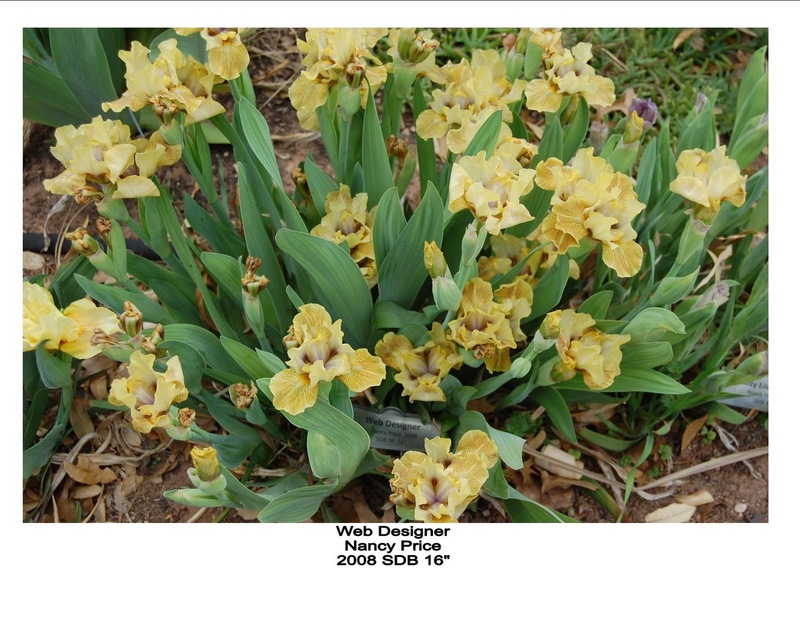 Oh, by the way… I took "Best of Show" two years with a median iris! They thought they scheduled the show for TB bloom! Not long ago I read the article "In Quest of Pink," written by Steve Poole and published in IRISES, the Bulletin of the American Iris Society. It described in a comprehensive way the search for the very best pink irises. The piece brought up several questions like, "what is pink?" "How intense of a pink iris do I like? Do I really have a real pink iris? And, most importantly the following question: What is color? While, researching for this post I came across an infinite number of websites dedicated to COLOR. Some were very scientific while others assumed a lighter, more fun approach to the subject. I will try to expose both. Yet another website, DevX, calls it this way: "Color is the byproduct of the spectrum of light, as it is reflected or absorbed, as received by the human eye and processed by the human brain." Being non-artistic and also color-challenged, my impressions of color have always been based in my association colors with everyday-life items. Green as in plants, brown like the earth, sky blue, yellow as the sun, orange as in the fruit, pink like baby stuff, black and white. Any deviation from these colors have always represented a challenge. A colleague of mine told me, "when deciding your garden color scheme, choose from a three-color palette. If you do that, you can't go wrong and you'll have a sure winning design" I said, "I can't do that, I like all colors." And yet, another friend said to me, "my partner is crazy, he wants to make a white and green garden only -- no other colors." And, I totally agreed with the crazy part. 19th century physiologist Karl Ewald Konstantin Hering (August 5, 1834 – January 26, 1918) devised the first theory of color vision. Hering believed that the visual system worked based on a system of color opponency. He said that there were six primary colors, coupled in three pairs: red–green, yellow–blue and white–black. So far so good, I can understand this and follow the meaning correctly. So, beyond the scientific understanding of color, what makes us chose different colors for our garden? Is it understanding of color combinations? Is it the appreciation of how color affects our mood? Is it having or not having coffee in the morning? "The standards are light purple paling to yellow tan rim and the falls are white ground, purple luminata wash. The beards are yellow with rust hair tips. Standards lilac mauve; falls smooth coffee-rose, slightly lighter area at tangerine orange beard. Standards rusty mahogany; style arms brass; falls bright violet, mahogany edges, brass shoulders; beards gold. S. fluted golden yellow; F. deep orchid violet, sharp brown rim on edge; yellow orange beard at base, turning into fuzzy violet horn. Standards white; falls chartreuse, radiating white ray pattern over 3/4 of petal; beards white, hairs faintly tipped tangerine; pronounced sweet fragrance." Am I the only to be challenged by these descriptions? I don't have a tip for you on how to best read these, I am merely exposing my shortcoming. Over time though, I learned to read these descriptions S-L-O-W-L-Y, one word at the time - visualize that; then one full complete sentence, and visualize that; and then the entire paragraph. 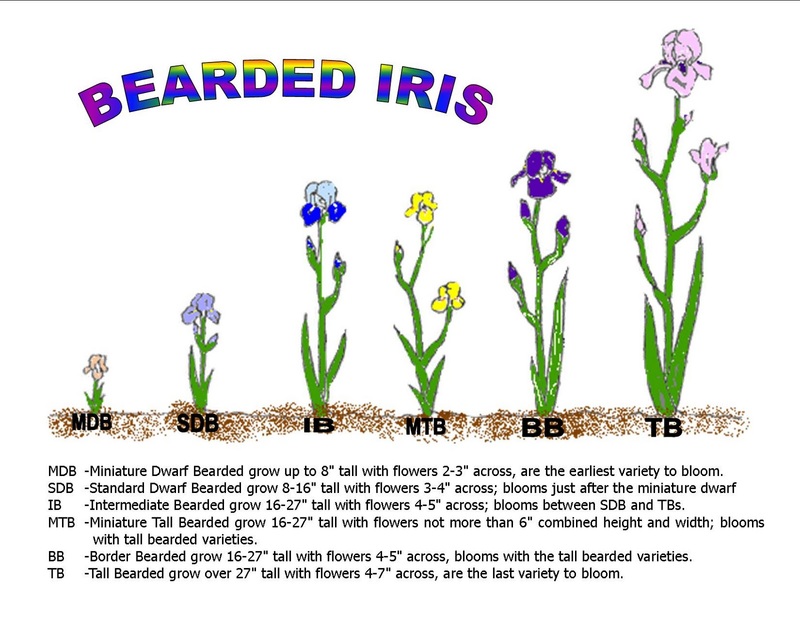 "Standards are...;" then, "Falls are...;" and, "Beards are..." OK, now I can visualize the entire flower. 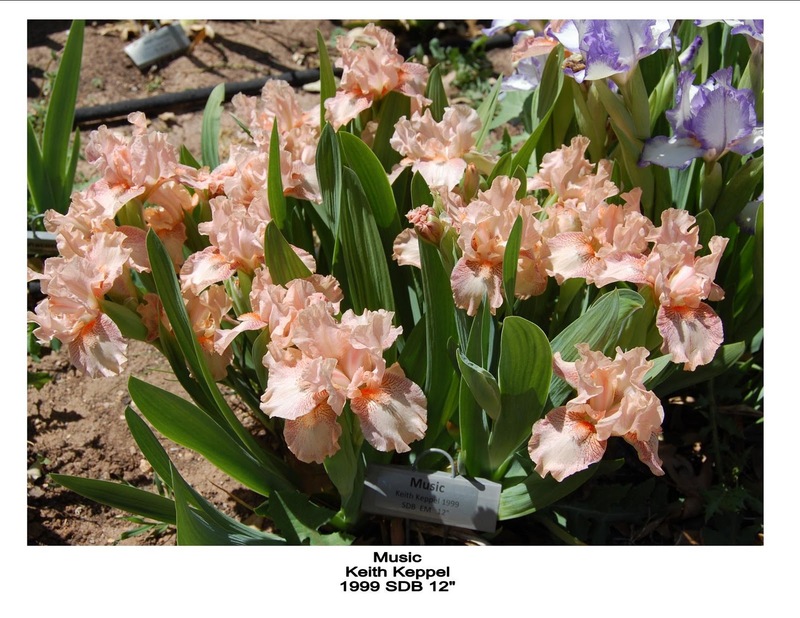 Do you have a tip for reading iris color descriptions and connecting to the visual image of it? And, these just in the green hue? These are many other colors waiting to be found In the website Name that Color. Chirag Mehta created a tool to show us how to locate color names such as the ones above. Hope you like playing with it as much as I did. 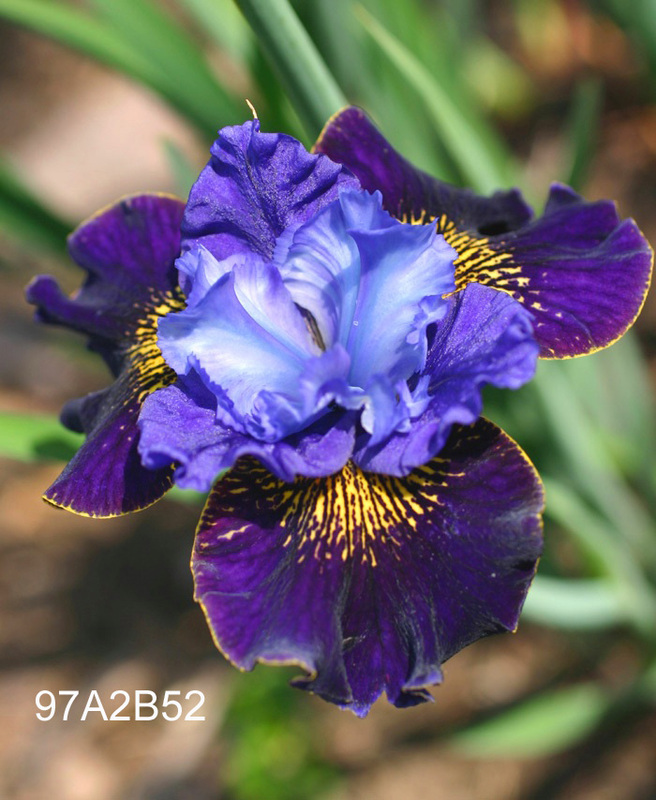 A wonderful showy new iris in an entirely new color. Almost a brass green, it is a bicolor with rich Chartreuse Lime standards and really quite brilliant golden falls toned Olive green with the color intensified to deep olive around the bright golden beard. The whole flower has a brassy metallic like overtone that makes it really stand out. Flowers are large and have excellent form and ultra heavy substance. One of our favorites. You might think such an odd color combination would be difficult to use in the garden, but not so. Once you see it combined with rich purples, rusts and reds you'll love the note it adds to the floral palette. Here it is planted with the deep red 'Spiked Punch', 'Black Castle', purple lupines, the rusty orange of 'Gingersnap', and in the back ground 'Siva Siva and 'Radiant Apogee'. 'Bayberry Candle' is as great today as it was when it was first introduced - if you enjoy irises with unique colors this one would be an excellent addition to your garden. Days are getting shorter. I am very aware of daytime because it affects me in so many ways. Sun light has set the direction of my day since I was a kid. Bright opened eyes at sunrise. Feeling sleepy even at sunset. I've never been a night owl. So, when I have less and less time for the evening walk with the pooches I know summer is ending, which in itself is not bad. Fall is the season I really enjoy. Most of all because it's the season I can start seeing irises come back to life, and can also spend more time outdoors. In the middle of summer, about a month a go or so, I started cleaning dry leaves off the tall beardeds, and trimming Spurias one to two inches off the ground. Only recently I started to gradually give iris some water after not watering all summer. 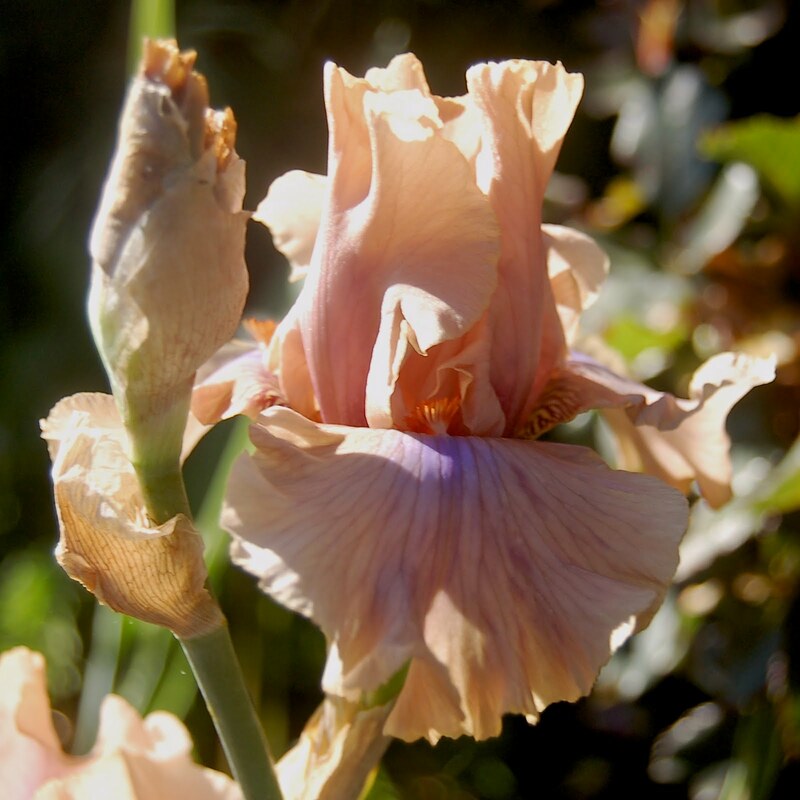 I do this for two reasons: first of all it's Southern California and water is expensive and in short supply with watering restrictions currently in existence; secondly, I have found that irises love their rest off water during the hot summer months. They like to gently bake under the sun, so no need to water tall bearded or Spurias here. 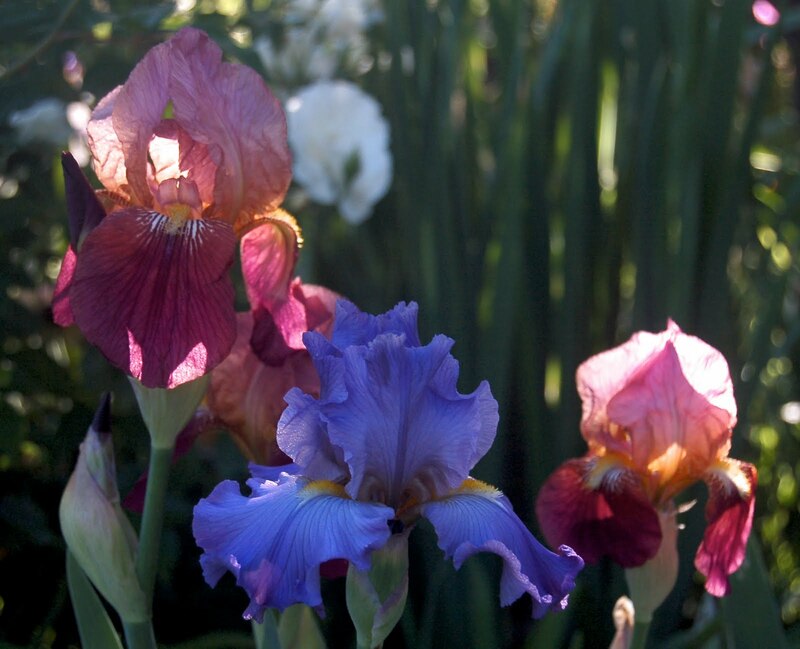 Change is in the air and irises are saying, "I wonder if I'll be blooming in the Spring." And this, will consist in most cases in food and water availability. Our summer, unlike the rest of the country has been a rather cool one, and even though we are three weeks away from fall, change is already in the air. So, my fall senses are telling me, "its time." It's time to start planning the spring garden. I start planning my spring garden with a map, a garden map. Do you keep a map of your garden? I started keeping one after I planted the one hundredth rhizome, and believe you me, I have referred to it many times over the years now that I have over three hundred. Garden maps are useful for different reasons. Sometimes, labels get stolen (yes, they do steel plant tags in this city) or get destroyed by people, or simply by dogs when their owners are not paying attention. Sometimes, if you are like me, you may like to refer to a particular iris in the middle of the night, so if you have a garden map, you don't have to run out in your jamas in the middle of the night. Whatever the case, garden maps are a second source of information for my garden, and I normally try to keep the map updated as I plant new rhizomes in the fall. I think I'm up to ten pages detailing my garden. Unlike my garden design, which is really abundant but complicated, and more geared towards an iris fanatic or collector, what do you think of the garden design below? It is so different, so uncluttered; pleasant due to its simplicity and because it was designed for our four-legged friends.